Around 2000 years ago paper making was invented in China and the craft continued to spread across the east and into Europe. By the 17th century techniques for mass production of decorated papers had been introduced. This enabled people to make dyed paper, marbled paper (Picture 1), block printed paper (Picture 2) and brocade paper. During this time paper was often made to mimic expensive materials such as gold, marble or fabrics and was mostly used for wrapping books, lining boxes and suitcases and recording musical scores. The first paper decorating method to be used was marbling, as this is the cheapest and possibly easiest method to use. Watercolour dye is placed on top of a tray of water and a pattern is made using brushes or combs. Then the paper is placed on top soaking up the dye and producing a mirror image. This technique was used everywhere from France and Italy to Turkey and Japan. 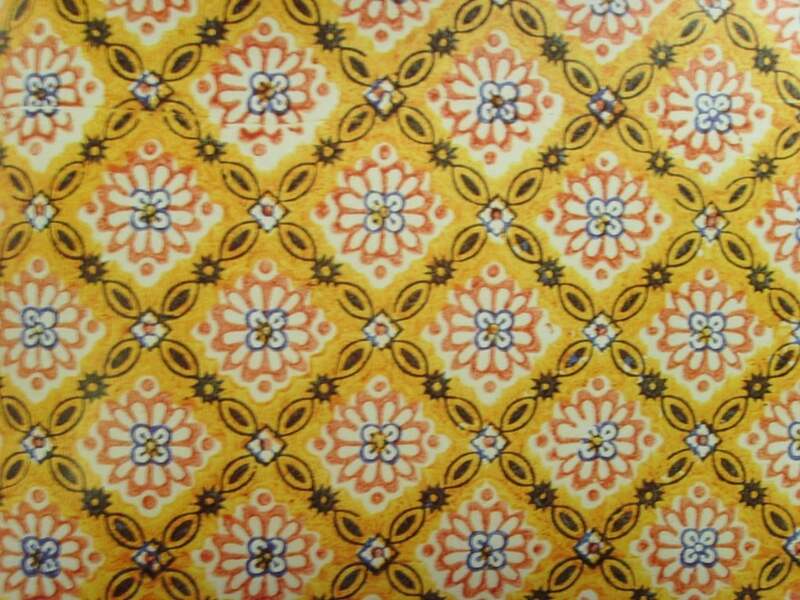 This kind of paper was used or decorating the inside of cabinets and for end papers. The technique is still used today in order to restore old books and for limited editions. Block printing was originally used for textiles however it became a popular method for printing on paper creating what was known as Chintz paper – which was the very technique used by William Morris. Traditional Indian Chintzes were decorated with floral designs and then embellished with complex patterns; if this were onto fabric it would afterwards be polished with shells. The desired pattern was carved into a wooden block and painted using brushes then pressed down onto paper. The method was repeated until the whole piece of paper was covered. Most block printed pattern have been inspired by Indian ornamental designs but otherwise geometric or repetitive designs were adopted. This was the best method for producing large panels of patterned paper and so was used in manufacturing wallpaper – this time consuming technique is still used by some today. Brocade papers were concerned with looking expensive and so used gold or silver in their designs. Patterns used for decoration are hugely influenced by textile printing and use interwoven, overlaying and flowery designs. The technique consisted of carving the design into a wooden block or for more elaborate designs the pattern was engraved into a copper plate and pressed into a sheet of gold foil. The plate is then placed onto a piece of freshly painted paper and the design is set. This type of paper was used notably in religious establishments and was produced first in Germany before being made famous by Italian paper makers, Remondini. I still find it fascinating that people are willing to spend such time decorating a material that will eventually disintegrate – but I am very glad they do!